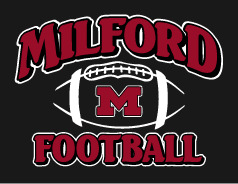 MILFORD H.S. FOOTBALL Apparel and Accessories are now available to order online! No orders will be taken after the SEPTEMBER 2nd order deadline. DELIVERY: ALL ORDERS WILL BE DELIVERED TO A TEAM WORKOUT OR A TEAM PRACTICE. Please select your size carefully. All orders are custom made to order and may not be returned for size exchange or refund. There is a size chart on the description page of each item. Please be sure to check that size chart before ordering.